An overview of global trends in privatization of public services. Privatization Watch - Issue 04/2017. Development banks have become a critical component of the effort to build up poorer economies, but their ways of working are flawed. As a result, their contributions can do more harm than good. many governments are calling on them to expand their contribution in key areas such as sustainable infrastructure, agriculture or industrialisation. In recent years some national Public Development Banks (PDBs) – particularly from BRICS countries (Brazil, Russia, India, China and South Africa) – have emerged as international actors by expanding their remit to financing projects in other developing countries. Not all PDBs succeed, and even the successful ones carry the risk of major negative impacts on development – sometimes due to external factors beyond their control, but more often because of flaws in their design and operation. As a new Eurodad report – published this week as the IMF and World Bank gather for their Spring Meetings in Washington DC – shows, inconsistent performance is partly down to the diverse mandates, roles and operational strategies of the institutions themselves. Eurodad believes some PDBs are failing because they have lost sight of why they were created. Eurodad’s 2017 International Conference will take place 20-22 June in The Hague bringing together leading civil society thinkers from around the globe working on issues including debt, tax justice, aid, private finance, the International Financial Institutions (IFIs) and global monetary reform to discuss alternative policies for a sustainable world, better ways of financing global development and strengthening global economic regulation and governance. PSI and Eurodad are organizing a workshop on PPPs on 20 June from 10:00 to 13:00. 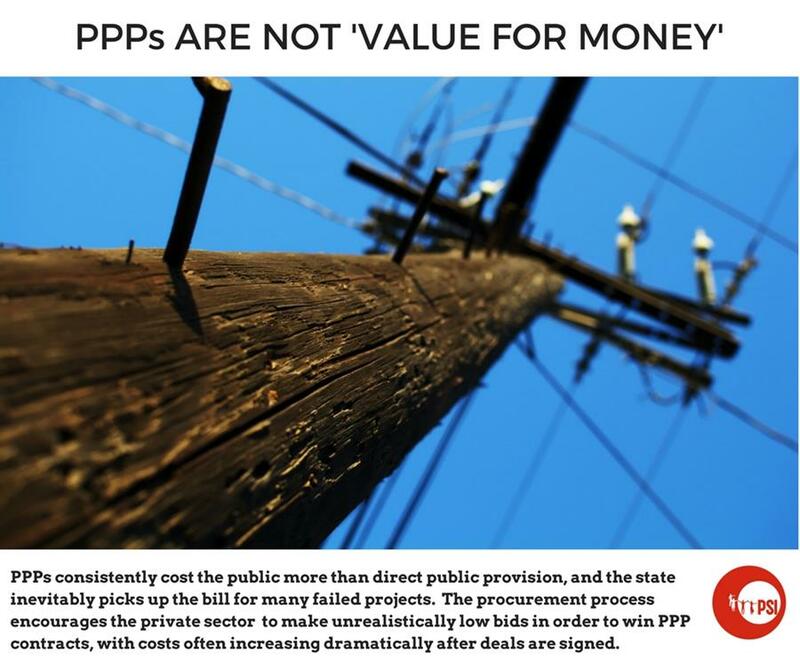 In the last year NGOs and trade unions have established a fruitful collaboration on PPPs, which resulted - among other things - in a joint boycott letter sent to the World Bank Group in February. The time is now for NGOs and trade unions to exchange ideas on potential advocacy and campaign activities for the year ahead and, if possible, agree on joint actions to further strengthen this collaboration and work towards a global campaign on PPPs. The takeaways from this workshop will also feed into two related events taking place within the programme of the conference: a workshop on market finance vs. public finance of infrastructure and a strategy meeting on publicly-backed private finance. Bridge International Academies, a private, for-profit company backed by American billionaires that has come under criticism for promoting the privatization of public education in Africa and elsewhere, has struck back against its critics. “Speaking to the UK’s International Development Select Committee, Shannon May said an ongoing legal battle over the future of Bridge’s Uganda business was down to a period of ‘misinformation’ and ‘confusion,’ that had since been ‘cleared up.’ In November, Uganda’s high court ordered that the education ministry could go ahead with plans to close Bridge’s 63 schools in the country due to concerns over standards and compliance with licensing regulations.” The company is also striking back in the courts. This new report, Investing in the crisis: Private participation in the education of Syrian refugees, by respected US academics, Assistant Professors Dr Francine Menashy and Dr Zeena Zakharia, University of Massachusetts Boston, explores the complex interrelationship between conflict and private sector participation through a case study of the education of Syrian refugees. It raises serious questions about the growing role of corporate actors and the ethical tensions between humanitarian and profit motivations to engage in this crisis. [Download PDF of full report]. PSI’s Executive Board expressed its full support for the general strike called by trade union centres for 28 April in response to the attacks on democracy, trade union and labour rights by the illegitimate government of Michel Temer. A general strike, the first in 20 years, clearly shows strong opposition from the working class to the backward steps taken by the government. According to the Central Única dos Trabalhadores (CUT – Central Workers’ Union of Brazil), it was the largest general strike in the country's history, attended by approximately 35 million people. Public and private sector workers, social movements, students and liberal professionals joined forces and held demonstrations in the streets throughout Brazil as a way of demonstrating their opposition to the labour and retirement reforms, in addition to the law on outsourcing. The strike affected public transport, banks, commerce and public and private schools, among other branches. The general strike happened after a series of demonstrations by the Brazilian trade unions and social movements throughout the country. On 8 March, International Women's Day (IWD), mass demonstrations were held to celebrate IWD and to demand the departure of Michel Temer. On 15 March, several sectors went on strike against the reform of the pension system, and hundreds of thousands protested on the streets of major cities. Two weeks after these massive marches, on 31 March, thousands took to the streets again in preparation for the general strike in protest of measures introduced by President Temer’s government. The main focus was the rejection of the welfare and labour reforms and the draft bill permitting indiscriminate outsourcing, among cries of “Temer Out”. Hundreds of thousands of people took to the streets again on 1st May to protest Michel Temer's policies in demonstrations organized by the trade unions and social movements in the main Brazilian cities." Despite the unequivocal message from the streets, the outsourcing bill approved by the National Congress was sanctioned by the President. Minister of Science, Technology, Innovation and Communications says that the Brazilian postal service will have to make “extreme” cuts or it will face privatization. The head of the government of Mexico City rules out the privatization of cleaning services, and promises a 30% increase for cleaning workers and improvements in their equipment and work vehicles. Activists in San Andrés Cholula (Puebla) denounce the local government for repressing opponents of water privatization. Movement members distributed flyers inviting citizens to an informational meeting on 6 April, against the privatization of water. On the street, uniformed municipal police told them to stop because they did not have a sound permit. Minutes later there were eight police cars and uniformed officers who noted that neighbors had complained of noise. Citizens replied to the officers that there is freedom of expression. The sanitation department of the government of Zapopan has its third director in less than a year. Workers have been demanding his resignation since the end of last year. The Plural Zapopan Workers Union “demanded better working conditions, as there are more than 30 broken trucks and employees should double shifts, [and] there were also differences by wage increases and distribution routes.” Rumors are circulating that the collection service will be privatized. Union leaders and education advocates joined forces on 21 April in front of the World Bank in protest of its continued support of for-profit education agencies in general, and specifically, Bridge International Academies. In a joint letter to Jim Yong Kim, president of the World Bank, the leaders of several teachers' unions from around the world and global unions call on the World Bank to immediately cease its support for low-fee private schools like Bridge International Academies. "Access to education is a fundamental human right and must not be based on a family’s ability to pay. By supporting the expansion of low-fee private schooling and other competitive practices, the World Bank is ensuring that a large number of the world's most vulnerable children have no hope for a quality education. We believe that a high-quality public education must be recognized as a public good, and that the provision of education is a primary responsibility of governments, not corporations and entrepreneurs." The next big thing in American infrastructure investment is public-private partnerships. Although private companies have long played a key role in designing and constructing public projects, federal and state officials increasingly view the private sector as the dollars-and-cents answer to digging out of the rubble of failing highways, bridges, and transit. Public-private partnerships may indeed provide the dollars that fearful politicians are unable to pry from the pockets of their tax-averse constituents. But P3s, as they are known in the infrastructure sector, are more complex than they appear to people who just want to get where they’re going. In a new Economic Policy Institute report, “No Free Bridge,” researcher Hunter Blair shows just why these partnerships are far from a “eureka” moment for America’s infrastructure woes. “The idea that P3s allow infrastructure to be built for free is economic snake oil,” Blair said. The plan to privatize the Sarajevo Insurance Company has split the ruling coalition parties and has been denounced by the opposition SDP. “The SBB has demanded from the Federation Government to annul its decision and present the exact data about the financial and market state of the company via the Privatization Agency to the Sarajevo Insurance Company Labour Union. In case this does not happen, the SBB said that it would ask for a replacement of Federation Prime Minister Fadil Novalic.” [BBC Monitoring European, 3 April 2017 (citing report by Bosnia-Herzegovina Federation public TV)]. Nuclear power workers in Civeaux go on strike over a number of issues, including their opposition to the privatization of dams in L'Isle-Jourdain and Chatellerault. Watch this tongue in cheek video by The People for Jeremy Corbyn where billionaire Richard Branson, explains why rail privatization is so great.